Well, four interceptions and two fumbles just about settled the 2009 season for UMass. The Maine game should also settle the QB controversy as neither UMass QB played well. The defense put in a workman-like effort, but did not give the offense any short fields to work with. Still felt strange not being at the game. Matty Vautour had a live Blog here. Lets have a big turnout for the Northeastern game next week. If we settle down and play we could still have a decent season. Today's game against Maine will be the first game of the season I will not be watching in person. Feels kinda strange not to be getting ready for the game. Hopefully, the UMass defense will continue the intensity they showed against Richmond. The Minutemen held the Spiders to 2 of 14 third downs , 1 of 5 fourth downs and a total of 236 yards---surely good enough to win most games. And remember that was against the the #1 team in the nation. The offense needs to get its mistakes under control. Just throw it to the guys in white shirts. Taking the sack or throwing it out of bounds is a lesser evil than turning the ball over. Run Nelson and Hernandez behind our very good OL. Let's beat the Black Bears and keep this season going. Matty Vautour says the pressure is on UMass. The Kennebeck Journal has an article on Black Bear LB Donte Dennis. The CAA's Game Day page has all the details on the League's games this Saturday. CSN's Chuck Burton has his weekly "The CSN Way: Rewriting the scripts' article up. Chuck Coulson has his weekly "Around FCS" column up. Creeping Fascism Alert: It's going to be illegal in Boulder, CO this Halloween to run naked with a Jack-0-Lantern on your head. 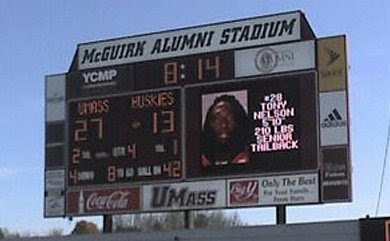 An image of the new scoreboard lifted from the UMass website. Happy Eve of All Saints Day! Matty Vautour has more on the UMass QB drama. The Sports Network's Brett Kahn previews this week's Top-25 games including UMass-Maine. Tomorrow's game between the Minutemen and the Black Bears will be televised on Comcast Sports New England. That's Channel 435 on Dish Network. UMass has offered a scholarship to Brandon Sparrow a 6-4 250 DT from Bedford, VA.
His Rivals page is here. This article features him. His HS team's name is the Minutemen. Mentioned as one of the top players in Virginia. Besides UMass, Sparrow holds offers from Ohio, Liberty and Marshall. Drawing interest from a host of I-A schools including Duke, Virginia and Virginia Tech. Maine has their game notes up here (html). Still no pdf. The Maine Campus has a Black Bear-Minutemen game article here. The UMass Daily Collegian says the UMass team still has Kyle Havens back. New Hampshire senior DT Jordan Long has been dismissed from the team. CSN's Terrance Thomas has this week's "CAA Today" column posted. The CAA has an article on the current national standings of the various league teams. UMass ranks 7th in the Lambert Cup. Brandon London greets old friends. 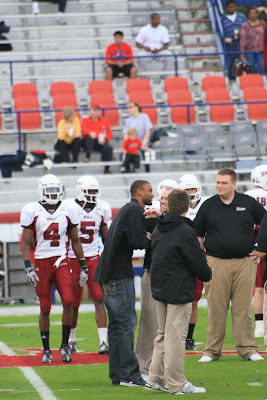 I have an abbreviated Picassa Web Album from the UMass-Richmond game posted here. From about the middle of the second quarter, it rained on and off for remainder of the game. Some of the rain was really heavy, so coverage of the game is pretty spotty. The low light caused a lot of blur and I had to discard most of the action shots. I didn't even get a end-of-the-game scoreboard shot. Back in 2007 after the hurricane during the UMass-Rhode Island game, I got back to my truck and water was running out of my point-and-shoot camera. It eventually recovered but I wasn't willing to take the chance with my Canon DSLR. UMass game notes for the Black Bears html here and pdf here. No Maine games notes online yet. The Springfield Republican says UMass football looks to turn it around. Josh Buchanan has a revised Payton and Buchanan Award outlook. Eastern Washington's post season ban has been lifted. The CAA's weekly press release with team capsules and details of this Saturday's games here. BTW, Richmond's DB Justin Rogers was CAA defensive player of the week. Update on the UConn stabbing. I've blogged before about UMass recruiting Vince Gallo a RB/LB and now option QB from Rotterdam NY. This article about him updates some information and says he's playing well for a coach named Whipple. Now being recruited by Temple, Bucknell, Brown and UNH. Matty Vautour reports that Kyle Havens will start against Maine. Coach Morris' weekly CAA telephone transcript. Keepers College Football ratings has UMass by 13+ over the Black Bears. David Coulson of The Sports Network looks at last Saturday's games as sees a Weekend of Surprises. The Altoona Mirror has a story about Black Bear CB Troy Harris. Well, Mrs blog and I are home safe after driving 630+ miles from Virginia. On the way home, we stopped at an old haunt of mine from UMass days: Joe's Pizza in Northampton. The place was packed.I hope to work on an abbreviated Web album of the Richmond game this evening. I had to cover my camera for much of the game because of the downpour. I spent a little time with the UMass press guide and tried to figure out if the six interceptions was a UMass opponent record. We threw five interceptions against Hofstra at McGuirk in 1997 (that's listed as the stadium opponent record). The guide does not list an all-time single game opponent interceptions record. The CAA press guide has the league record for interceptions as 7, which occurred four times, last by Villanova vs. Penn on 9/22/07. Matty Vautour has another article on the Richmond game here. He mentions UMass LB Tyler Holmes has 17 tackles. Tyler had a big contingent of fans at the game. UMass had a pretty decent crowd at Richmond and we were making a lot of noise--at least until the downpour sent a lot of people to the exits. Vautour's Top-25 vote this week. The Bangor Daily News has a story about UMaine and the current and future status of CAA football. Josh Buchanan has a mid-year FCS top players watch list posted. If you follow New England college football, you probably will be pleased that Dartmouth broke a seventeen game losing streak Saturday. The offense however, was a train wreck. Six interceptions and one of those for a touchdown. We also muffed a punt. The offense gave up the ball on the UMass 20, 27, 17, 28 and on and on. Tony Nelson DNP and Jonathan Hernandez DNP in the second half. The Spiders are good, but not that good. Their sportsmanship could use some work also. Boston Globe says we threw away the game. The Richmond Times says Richmond romped. The Springfield Republican said UMass fell hard. All this week's FCS scores here. Kansas State beat Colorado 20-6 to run their record to 5-3. They remain at the top of the Big 12 North standings. Two more wins should put the Wildcats in a bowl game. Albany won its sixth consecutive game. Stony Brook moved to 3-0 in the Big South. Mrs Blog and I are driving back to New Hampshire today. It was a good trip abet with a wet, disappointing end. Again congrats to the UMass defense in an effort that you would not see from the stats unless you were there. Images from yesterday's beach walk. A gift from the Sea. Dolphins swam 50 yards out. Plovers get to play in the surf every day. The Boston Herald says Richmond is UMass' #1 priority. The Springfield Republican says UMass will have to be error free against Richmond. The Boston Globe says Vladimir Ducasse is headed to the NFL. The Richmond Times says the Spiders seek a quick start against UMass. Matty Vautour says UMass is still looking for its first road win. David Coulson of the Sports Network says the playoff field looks crowded this year. CSN's Terrance Thomas looks at the CAA at mid-season. Chuck Burton looks at FCS's "Shoe-ins" for the playoffs. Several images from the Virginia Beach area. Click on the image and Blogger displays a much larger view. The image of the Cape Henry light house is from the top of the old Cape Henry light. The weather is not looking good for the game Saturday. Not sure if that will help UMass or not. The Washington Examiner has an article on Tony Nelson. The Worcester Telegram has a mention of Jonathan Hernandez. Matty Vautour on the Minutemen's preparation for the Spiders. The Sports Network previews this week's Top-25 FCS games. Villanova HC Andy Talley is approaching a coaching milestone. The Seacost Online says UNH needs to rebound against Hofstra. Has anyone seen the new scoreboard? WWLP has a preview of the UMass-Richmond game. The Springfield Republican has an article on UMass' running back tandem of Hernandez and Nelson. Matty Vautour has an article on Armando Cuko's super senior season. The NCAA has an article on Richmond's Eric Ward. The Richmond student paper has a mid-season report on the Spiders' season by HC Mike London. More articles on Ihedigbo's suspension here and here. CBS 6 reports twenty NFL teams have looked at UNH's Scott Sicko. He had 10 catches/145 yards/2 TD's against UMass. The CAA has its weekly press release on all the league teams up. I have a Picassa web album posted for the New Hampshire game. Again, nothing special, but it should give you a feeling for the day. UMass has its game notes for the the Richmond game up. Html here and pdf here. Richmond's game notes html here and pdf here. The Richmond Times has a mention of Ke'Mon Bailey, who is from Virginia. Matty Vautour on the contributions of Darren Thellen and Stephane Milhim to the Minutemen's 2009 season. He also said there has been no decision yet on the return of the four players suspended because of a drug arrest. The Gridiron Power Index has Richmond remaining in the #1 spot and UMass is up to #11. Thanks to one of the UMass Football Blog's vast army of reporters sent me a link on James Ihedigbo's being ejected from last Sunday's game against Buffalo. I can receive e-mail, but I can't send to thank him. Sending requires me to remember my fairpoint.net password and there are just to many in my memory right now. Well, after a struggle, I've got the wireless connection working. Good morning from Virginia Beach. Good news! Miles and Nelson will be available to play for the Richmond Game. More from Matty Vautour on the return of Miles and Nelson. Jonathan Hernandez was the CAA's Offensive Player-of-the-Week and Richmond's Derek Hatcher was the CAA's Special Teams Player-of-the-Week. Story here. Coach Morris' weekly CAA teleconference transcription here. The New Hampshire win bought UMass up to the 14th to 16th slots in various polls. Dave Coulson reviews last Saturday's FCS action. Keepers College Football Ratings has the Spiders by 3.59 over the Minutemen. Now that I have a working internet connection, I'll try to post a web album of Saturday's big win over UNH this evening or by tomorrow morning. Good Morning from Fredericksburg, VA. Today Mrs Blog and I will finish our trip down to Virginia Beach. The wireless connection here at the motel is running around 10%, so this morning's blog may be abbreviated. The Boston Herald says the Minutemen are walking on air after the UNH win. Foster's Daily Democrat says the Wildcats look to rebound. Matty Vautour has three stars against UNH. Honored were Jonathan Hernandez, Eric Dickson and Armando Cuko. Kudos also from the Blog to Kumar Davis and Stephine Milhim who also played well filling in for injured starters. He also says defense and heart was the difference against the Wildcats. The Springfield Republican looks at the UMass injuries. Six Top-25 FCS teams lost Saturday. 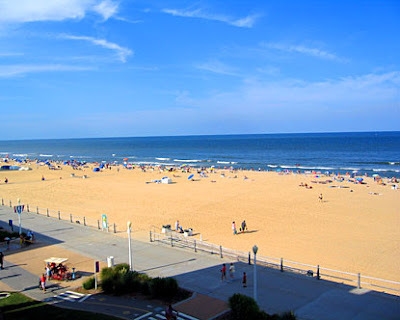 Mrs Blog and I will be spending a week in Virginia Beach prior to taking in the Spiders-UMass game in Richmond. As always, I will try to update the Blog if I have an Internet connection. I'll post a UNH game album hopefully this evening. Hope everyone has a nice Sunday. The Boston Herald says Hernandez led the way. Seacoast Online said UMass hands UNH their first loss. Concord Monitor said no Mass appeal. The Springfield Republican said it was a thriller. Ron Chimelis has an article on how UMass overcame a bunch of injuries. Matty Vautour says UMass held on. UMass Athletic Dept write-up with notes, quotes and video here. All of Saturday's CAA game news here. Maine led at the half, but Richmond scored four straight TD's in the second half to beat the Black Bears 38-21. David Coulson of the The Sports Network covers the Villanova-JMU game. Albany set a conference record with a win over Bryant. Kansas State crushed Texas A&M 62-14. Six ranked FCS teams lost yesterday. Wow, what a game! UMass, missing a ton of starters, beat the #4 team in a pulsating game under the lights at McGuirk. The UMass defense was immense. They kept pounding on Tolman and he finally threw the deciding interception. The defense also shut down the Wildcat rushing attack. Even the first UNH score was close. Two UMass defenders went for the interception and it went right through their hands. After that, the UMass defense battled UNH on every play. With Tony Nelson out again, Jonathan Hernandez was a step away during the first half of breaking a long run. Finally he dominated in the fourth quarter. Hernandez was named the winer of the Bill Knight MVP Trophy. A great, gutsy win by a depleted UMass squad. The Boston Globe says Zero Hour is upon the Minutemen. The Springfield Republican says UMass sorely needs a victory today. The Laconia Citizen says UNH is geared up for a clash with the Minutemen. Matty Vautour has a game-day preview of the game here. He also looks at the expanded role of Soph. H-back Emile Igwenagu . Remember the game is on Comcast Sports New England if you want to set your DVR. David Coulson has a full column on the competition to host the National Championship game. The better the venue, the better it will be for Division. It would be wonderful if the National Championship game picked up a corporate sponsor. That would the cash-strapped FCS some money to compete for in addition to the glory. The CAA game day page is here. The page has media links and information about all of today's CAA games. The weather looks to be cloudy with temperatures in the high 40's for game time. It is snowing briskly here in Jaffrey, NH. "The new video scoreboard will not be installed at McGuirk Stadium in time for this Saturday's football game as originally planned. The production has been delayed. Look for it to be installed in the coming weeks. The athletic department apologizes it will not be ready for Homecoming." Ron Chimelis ruminates on the return of the Foolish Four. The Boston Herald says UMass hopes to be in Cruz control. Matty Vautour says it's a must win game. Matty also says the starting UMass MLB Kurt Filler is gone for the season with a torn ACL suffered during the game with Stony Brook. Four articles from the New Hampshire perspective here and here and here and here. Roger Brown of the New Hampshire Football Report picks the UMass-UNH game. The Sports Network's Brett Kahn previews this week's Top-25 games. The revised Payton Watch and Buchanan Award watch list have been posted. Josh Buchanan has a mid-season FCS awards story with two UMass players on the first team. CSN's Terrance Thomas has his week "CAA Today" column entitled "Road Warriors". 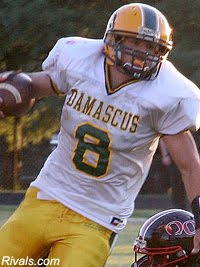 UMass is interested in Brian Lucas a 6-0 215 pd RB from Damascus, MD. Lucas also has his own recruiting site here. This article from 2008 features him. Lucas has offers from Army and Monmouth. Drawing interest form Bryan, Cornell, Villanova and Virginia. UMass reinstates the Foolish Four. Springfield Republican article here. Matty Vautour has more here. Returning are Mike Mele, Bob McLaughlin, James Carven and starting Free Safety Shane Viveiros . The Daily Collegian says UMass hopes to make it four straight at home. Roger Brown of the New Hampshire Football report says UNH QB R.J. Tolman is hurting. Tolman's Wilcat bio here. At least four cities have submitted bids for the FCS National Championship game in 2010. In the running are Fresno, TX, Missoula Montana, Spokane, WA and Little Rock, AK. Dallas News story about Fresno, TX bid here. Chattanogna, TN is bidding to retain the game as well. UMass has offered a scholarship to Antoine Tharpe a 5-11 175 pd DB from Coral Springs, FL. Nine minutes of highlights here. Tharpe also has offers from Memphis, Illinois State and Tennessee State. Drawing interest from Florida State, Miami of Florida, Mississippi and UCF. The Springfield Repbulican says the loss to Delaware cost the Minutemen six spots in the latest polls. David Coulson in his "Around FCS" column called it an upset weekend. The CAA has its weekly press release up with stats, notes and and other league news. Keepers College Football rankings has UMass at #12. Click on the image above and Blogger displays a much larger view. I don't suppose most UMass fans will want to be reminded of last Saturday's game against the Hens, but I do have a web gallery of images here. If you've never been to Newark, it will give you a feeling of the place. Note the Hens video scoreboard and the TWO artificial surface practice fields. Coach Morris says we did not "Come to Play" against Delaware. A transcription of Coach Morris' CAA teleconference call. Matty Vautour looks at the playoff contenders in the CAA. After the Delaware loss, the Minutemen dropped to 19th and 20th in the major FCS polls. The NCAA FCS playoff selection committee will again use the CSN Gridiron Power Index in their playoff selection calculations. UNH is riding high after beating Villanova last Saturday. UNH's Terrance Klein was the CAA's defensive Player-of-the-Week. The Wildcats got the Tolman to Sicko connection working. Keepers' College football rankings has UMass by 3 over New Hampshire. Misery-loves-company Dept: Boston College QB Dave Shinskie had the lowest efficiency rating (-22.20) in the last five years of college football against Virginia Tech. One of of the UMass football Blog's many reporters e-mailed me to say that Troy Offensive Coordinator Neil Brown's UMass connections received lots of mentions in last Saturday's televised win over Middle Tennessee State. UMass has added WBIX 1060 AM to the Minutemen radio network. WBIX website here. More from the Delaware side on the Hens win over UMass. Matty Vautour picks three players who had good performances against Delaware: Victor Cruz, Tyler Holmes, and Emil Igwenagu. He also looks at the road to the playoffs after the Delaware defeat. Starting a new week, Matty says that UNH will be a stiff challenge for the Minutemen. More on UNH's win here . All of Saturday's FCS scores here . One positive from the Delaware game was that the UMass defense played well in spurts. We had two take-aways in the first half, but the offense did not convert on either of them. Then in the fourth quarter, UMass had three on-side kicks (the first almost worked, the other two were not close) giving the Hens excellent field position. The UMass defense only gave up two field goals. "Armando Cuko kicked a career-long 51-yard field goal near the end of the first quarter. It was tied for third-longest in UMass history with Chris Koepplin (2007). The record of 52 is held by Denis Gagnon (1971) and Sandro Vitiello (1978). Cuko did attempt a 52-yarder in the second quarter, which came up short. " It should also be noted that Cuko's kick was not wind aided. The streamers on the goalposts were not moving. I'll be back, maybe this evening, with a web gallery of images from the Delaware game. The Springfield Republican has a game article here. The News Journal says the Hens were overpowering. The Sports Network says the Minutemen came up very short in Newark. Matt Vautour said the Minutemen could not catch the Hens. UMass write-up with notes and box score here. Delaware Athletic Dept write-up here. News on all the CAA games here. They had the UNH-Villanova results reversed on the scoreboard at Newark. All the FCS scores here. Our friends from Kansas State got smoked by Texas Tech 66-14. The superlative UMass Marching Band made the trip and dazzled the home Hen crowd with a solo routine and with a combined set with the Delaware Band. That turned out to be the highlight of the evening for UMass fans. As for the game, UMass sure didn't look like the squad that went toe-to-toe with Kansas State for sixty minutes. Maybe the problems of the Foolish Four had its effect after all. It did, in some part, because RFr. safety Darren Thellen started and got picked on by Devlin most of the first half. I don't know if the UMass radio feed mentioned if something was wrong with Kumar Davis. Maybe he had the flu or was nicked up? Jeromy Miles came up limping after one kickoff, and if he had not been able to continue, UMass would have been flat out of Safeties. Not having Shane Viveiros certainly hurt. The UMass offense was out of sync all game. Mysteriously, we tried running right most of the game instead of left over our All-American tackle Vladimir Ducasse. That did not work very well---we had 15 yards rushing in the first half. Hopefully, UMass will get its mojo back for the New Hampshire game. Whatever was missing for the Minutemen made this a tough loss to watch. Then again, win or lose-----Go UMass! 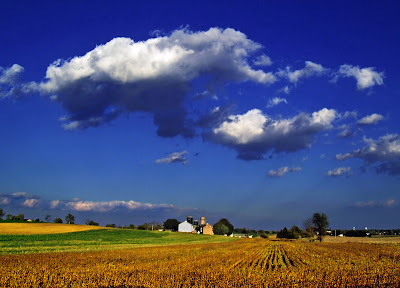 Good Morning from cloudy Lancaster County. The forecast is for possible showers this morning and clearing later in the day. Mrs Blog and I will be driving to Newark at about 3:00 pm after she gets in some last minute emergency shopping. Let me say before we leave "Go UMass!" Matty Vautour says UMass has a tough road trip in Delaware. The News-Journal says the Hens step up to a tougher CAA test today. They also have a UMass-Delaware preview. Bruce Dowd has the week six edition of his "Dowd's Den" column up. Chuck Burton has his "The CSN Way:Numbers" column available. The CAA has this week's "Game Day" page with all the media details and previews here. Kansas State meets Texas Tech today. The Red Raiders do not have anywhere near the team they had last year and K-State seems to be gaining traction. It will be interesting to see how they do. Albany will be looking for their fourth straight win after playing UMass. Rhody gets CAA bottom feeder Towson. The Rams lost their impressive QB Chis Paul-Etienne against UConn. They get Towson at a good time. And Stony Brook (1-3) plays in the Potato Bowl against North Dakota. WWLP has a UMass-Delaware preview here. Matty Vautour says UMass is rested and ready. The Daily Collegian looks at the Delaware game. Ron Chimelis says Jeromy Miles plays football with discipline. Terrance Thomas Sr. says the word in the CAA is perseverance. 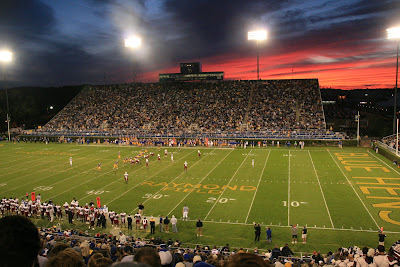 Brett Kahn previews this week's games and predicts UMass will lose to Delaware 20-17. Marcel Shipp had 69 yards in the first game of the Las Vegas Locomotives. Nice story in the Collegian about UMass LB Tyler Holms. Another story from the Collegian about the preparations for the Delaware game. Coach Morris states that D.J. Adeoba will return for the Delaware game. He also says Josh Jennings and Rob Getek are not close to returning. Matty Vautour has more on Adeoba. 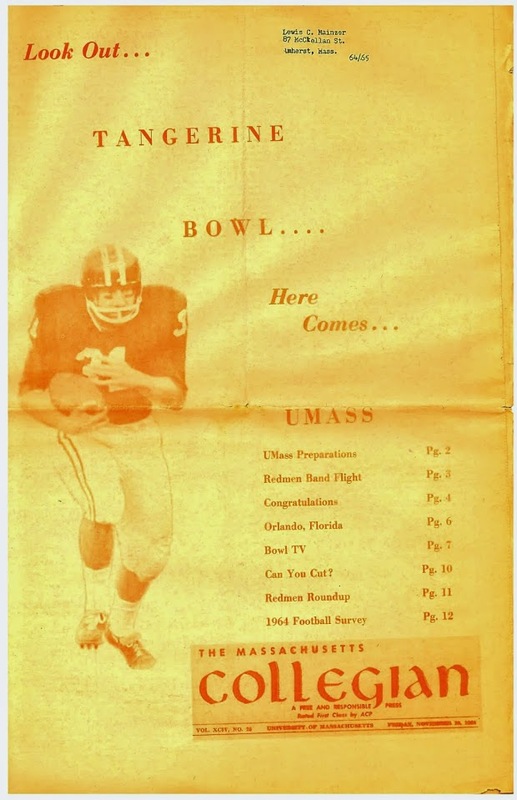 The Hens finally have their game notes for UMass up (pdf). The Collegian looks at the Hens passing attack. Spencer Whipple is with his father in Miami. The CAA has notes on both the Coach's and The Sports Network's Top-25 polls. Good Morning from Lancaster County. It's a flat out beautiful autumn day. A strong wind is moving shreds of clouds away and making autumn leaves swirl. 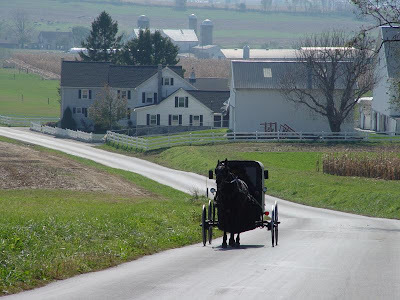 All is right with the world in Amish farm country. Still no Delaware game notes available. David Coulson has his weekly "Around FCS" column here. The CAA has its weekly press release with game notes and other football news here. The first edition of the GPI (Gridiron Power Index) has UMass at #6. Mickey Matthews on his loss to Hofstra: He told his players they didn't need to shower, because nobody played hard enough to sweat. UPDATE: Whoa! The Amish internet seems to be working. See everyone tomorrow morning. Mrs Blog and I are now moving down to Bird-in-Hand. She will get to shop-till-she-drops for the next four days. If I have a working Internet connection, I will keep the Blog going. If not, I hope to see a lot of Minutemen fans at the Delaware game. Remember yesterday I talked about Steamtown renovating a former Boston & Maine Berkshire steam engine? They've got some work to go. Click on the image and Blogger displays a much larger view. Delaware hopes to keep running against UMass. Pat Devlin is the #1 QB in the CAA. Two Hens were CAA players-of-the-Week for their performance against Maine. UMass has its game notes up for Delaware. Html here. Pdf here. Coach Morris' CAA telephone conference transcription here. Delaware does not have their game notes up yet. Matty Vautour says UMass is eyeing the return of Tony Nelson. For beating the heck out of Bye, the Minutemen made a fairly big jump in the polls. The Springfield Republican has UMass in the heart of their schedule. Good Morning from Scranton, PA. Looks like we will spend all day at Steamtown. They are renovating a former Boston & Maine 4-6-2 steam engine. The B&M tracks ran just behind my house when I was a kid. The steam engine was before my time, but I use to fall asleep listening to the B&M diesels hauling freight past my backyard. Matty Vautour has his weekly "Path to the Playoffs" column. He also has his FCS Top-25 votes. Updated CAA recaps for Saturday's Games. All the FCS scores from Saturday's games here. The Springfield Republican has a slightly updated version of the arrest of the Foolish Four. Note that both the AD and Coach Morris have declined comment. That will also be the policy of this blog. Delaware found its running game against the Maine Black Bears. The Hens Matt Marcorelle has been lost for the season. Delaware stadium has a new look. Has anyone been to McGuirk to check out the construction of the new scoreboard? Matt Lawrence will take part in a Question & Answer session for the Baltimore Ravens today at 7:00 pm. Mrs Blog and I are off on our second road trip of the year. Tomorrow we will be visiting Steamtown in Scranton, PA.
From there we are moving to Bird-in-Hand, PA in the heart of Lancaster County. We are staying just up the street from the Bird-in-hand Farmers Market. For four days Mrs. Blog will get some payback for loyally following me to all those football games. She starts hyperventilating when she hears "Amish Quilts" and "Amish Crafts" So for four days, she will shop till she drops. Don't worry about me. I bring a camping chair and lots of reading material. It turns out that this shoppers paradise is only about 35 miles from Newark,DE via back roads like PA 896. Hope to see a lot of UMass fans at the game. As usual I'll try to keep the Blog going. However, if it falls silent, you will know that I do not have a working Internet connection and I'll be back next Sunday. The CAA recaps are here. The big upset was Hofstra over JMU. Villanova handled William & Mary. Kansas State won on a blocked extra point. Albany won its 15th conference game in a row. Chuck Burton has his column "The CSN Way" here. Terrence Thomas, Sr has his weekly "CAA Today" column here. The Versus television network will be carrying the Villanova-William & Mary game at 3:30 pm. That's channel 151 on the Dish Network. UMass suspends four players after they are arrested for possession of a controlled substance. Suspended were Mike Mele, Shane Viveiros, Bob McLaughlin and James Carven. UMass is interested in Billy Perez a QB from Park Vista HS in Lake Worth, Florida. Be Recruited page and video high lights here. This article by the Palm Beach Post mentions him several times. Interested are FBS schools Florida Atlantic, Indiana, Florida and Florida State. FCS schools include UMass, Jacksonville State and Charleston Southern. UMass has a new Photo Store with lots of UMass Football images. The UMass Athletic Dept website has a photo gallery of Pop Warner night at McGuirk. JB Scouting predicts that Vladimir Ducasse will be one of the "Small School" players invited to the NFL combine this year. The CAA football standings are here. Dave Coulson's "Around FCS" column discusses the Villanova-William & Mary game . TV and web video links for this week's FCS games are listed here. The University of Florida is prepared (pdf download). UMass is interested in 6-4 215 pd Mike Delaney from Foxboro and Matt Campbell a 6-0 215 pd FB from Attleboro. Youtube Highlights on Delany here. His Rivals page here. ESPN writeup and highlights on Campbell here. Matt's Rivals page here. Article mentioning both Delany and Campbell here. Besides UMass, both have been receiving interest from the Northeast FBS schools Boston College, Rutgers, UConn and Syracuse. The CAA has six teams ranked in the top 25 and five of the top seven. New Hampshire's QB R.J. Tolman has "turf toe" and is uncertain for the Towson game. UMass' once, and probably future opponent, Bryant is making strides with their program. The Sports Network's Brett Kahn previews the FCS Top-25 games this week. Interesting article about Richmond's HC Mike London.